Here in the Lake District the National Trust looks after an awful lot of land - about a fifth of all the countryside in the National Park. 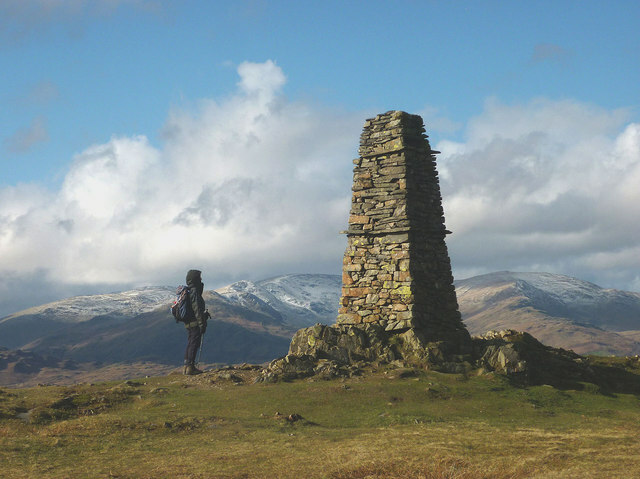 But it’s not all high, open fells, we also care for iconic historic places like Beatrix Potter’s Hill Top, and James Garth Marshall’s Tarn Hows. Located in the low level hills between the villages of Coniston and Hawkshead, Tarn Hows is ideal for a walk or cycle trip from either, and has lovely circular walks around the tarn. With a commanding panorama out across the wider Lake District fells, it's a favourite with both regular and first-time visitors to the area, attracting over 300,000 visitors a year, and is popular with artists and photographers who love the fantastic views. Yet despite Tarn Hows dramatic setting, it’s very much a ‘man-made’ environment. It was created as part of a designed landscape by James Garth Marshall, a wealthy Leeds industrialist and owner of the Monk Coniston Estate, in the 1860s, in the ‘picturesque’ style popular at the time. Tarn Hows as we see it today was originally three natural tarns. When Marshall bought it he embarked on a project to create a new body of water surrounded by a bold, ornamental planting scheme, which also had an industrial use to feed his sawmill, downstream in Coniston. Tarn Hows in the late 19th century, much less wooded than it is today. Marshall’s vision involved clumps of trees planted in a carefully considered way, highlighting rocky knolls and the dramatic Lakes landscape beyond. The new planting was protected by ‘nurse’ crops of conifers, which were intended to be removed once the young trees were established. However, Marshall died before his vision was realised and the nurse crops were never removed. 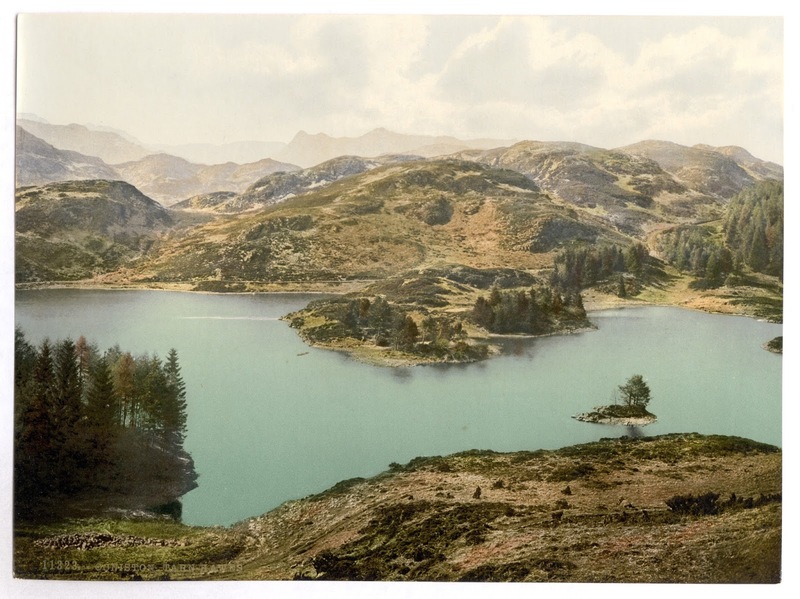 Trees then grew to dominate the Tarn Hows panorama as we know it today. 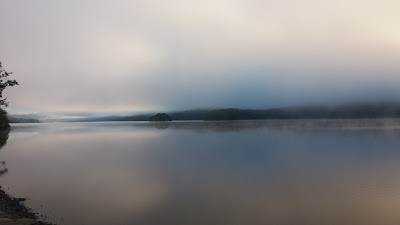 Recently, the Trust decided that the majestic views over the tarn and across to the fells beyond were in danger of being lost amongst the trees. Marshall’s clumps of specimen trees, although still present, were hard to see in the thick growth, his vision fading in the passage of time. 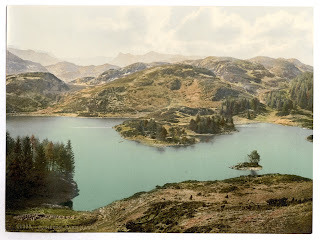 Aware of the popularity of the present-day landscape however, and realising that many visitors who came to enjoy Tarn Hows didn’t know of Marshall’s ‘hidden’ landscape, the Trust carried out a full survey and consultation with local stakeholders to decide on the most appropriate course of action. As Tarn Hows is highly protected as a Site of Special Scientific Interest, we also had to make sure that work would protect the rare plant communities and habitats that exist there. An approach was agreed which therefore aimed to restore elements of Marshall’s vision, without impacting too suddenly and dramatically on the modern cherished landscape. There will be a gradual receding of the modern character and a simultaneous emergence of Marshall’s vision, with a medium term co-existence of the two landscape characters. Work will take place very incrementally over a number of years, with no sudden or drastic changes to the views and feel of Tarn Hows, and there will be periods when little or no work is being carried out there. We have now started this work to restore elements of the designed landscape, as it was intended to look when it was originally created. This will involve very gradually removing some trees, particularly thinning areas where there is dense regrowth, to open up some views over the tarn and across to the fells beyond, as well as revealing some of the rocky knolls identified in the original design which have become overgrown. Opening up views across the tarn and surrounding countryside will enable visitors to enjoy perspectives on this landscape as it was originally intended to look in the 19th century, as well as helping to protect some of those rare habitats around Tarn Hows. 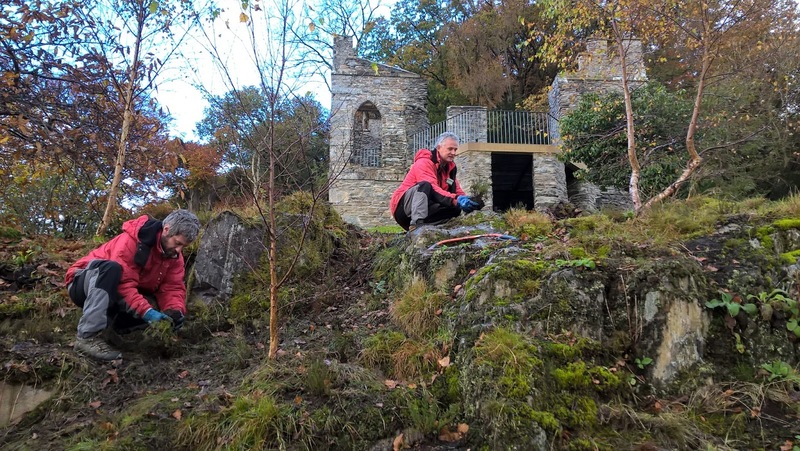 Our ranger teams will also be working to partially reinstate parts of Marshall’s vision with some new planting in selected locations from the suite of trees in his original plans. Work will be done very gradually over a number of years, but starting now means that we can avoid too much intrusive felling work in the future, and keep the visual impact on the landscape to a minimum. So if you’re out and about around Tarn Hows in the coming months, and see us working down there, do stop and have a chat. We’d love to hear your thoughts on this exciting project! 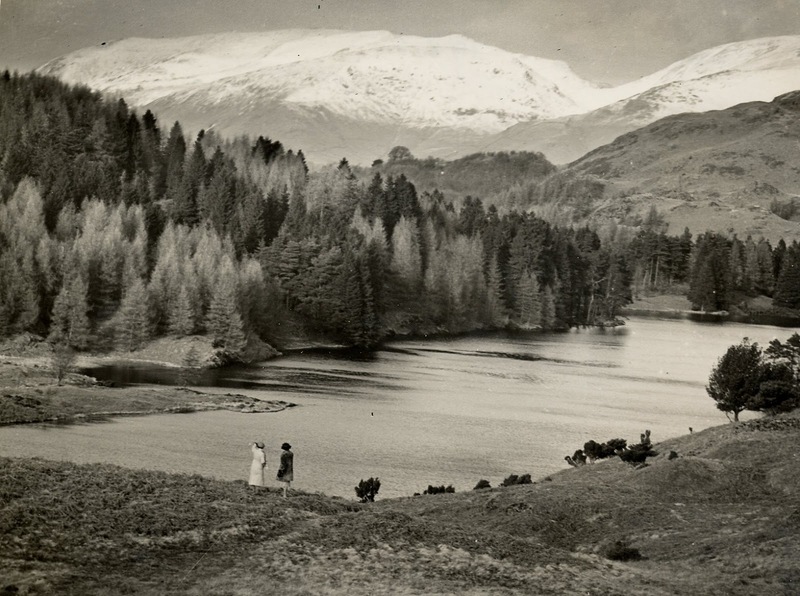 Looking up Tarn Hows towards Helvellyn, possibly 1920's. Another year is coming to a close and it seems an appropriate time to look back and reflect, to think about the highlights, what’s been achieved and those New Year resolutions. A) Put an end to global poverty. B) Bring about world peace. Mmmm.........Well if you’ve opened a newspaper, or turned on the news recently, you’ll have realised that I haven’t made quite as much progress on the first two as I would have liked, and indeed after a strong start in the garage earlier this year I have slipped back there somewhat in recent months as well. So much so in fact that a neighbours son came round recently while playing; aged about 6 he comes from a family who keep their house scrupulously clean and are fastidiously neat. 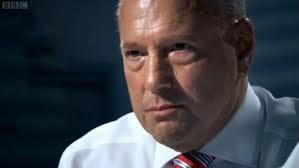 He was playing the role of an inspector of some description, complete with clip board , pencil and a disapproving look that Claude Littner off ‘The Apprentice’ would have approved of ! He took a look inside the garage and after not much deliberation ,declared it a fail, on some unspecified health and safety infringement, .... cheeky monkey. What’s wrong with kids these days anyway, playing at Health and Safety Inspectors, when they should be out stealing from shops, smashing things up and having spitting competitions ? B) Use the word ‘truckle’ whenever I can. But, if you decide you have more about you than me, why not make some more challenging resolutions. 2. 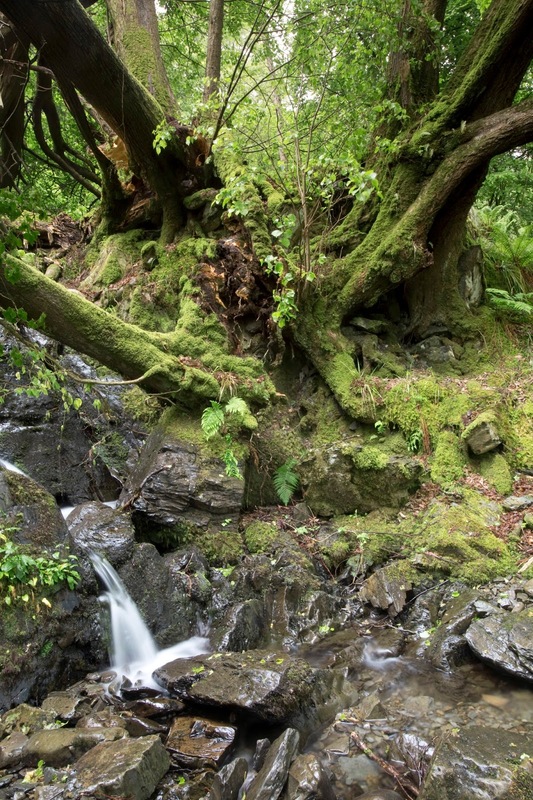 Re-connect with the natural world – Spend some quality ‘you time’ or should that be ‘Yew time’ in the beautiful, tranquil Dodgson and Bailiff Woods on the east side of Coniston Water, Cumbria. 3. 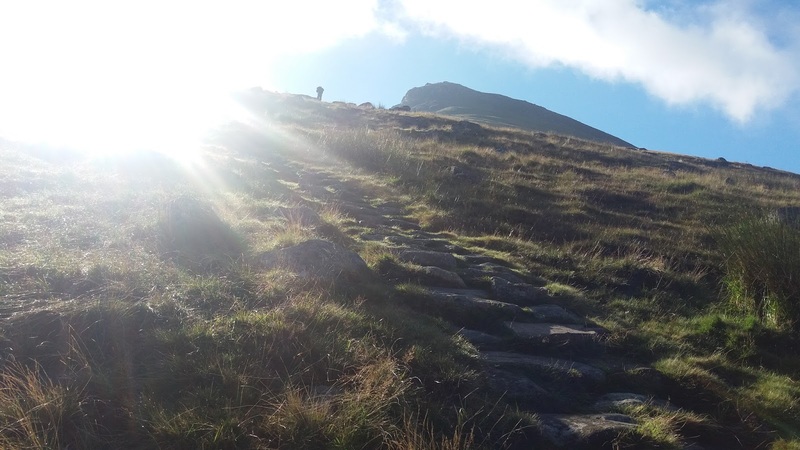 Climb your first mountain – walk in the footsteps of Chris Bonnington. The summit of Latterbarrow at 803ft is a good starting point and gives you views as good as any summit in the Lakes. Alfred Wainright says it's "a circular walk needing little effort yet yielding much delight". 4. Do more work for charity – volunteer for the National Trust in the countryside or at one of our houses. Whatever you decide to do have happy and peaceful 2017, this has been Ranger Paul signing off for the South Lakes Ranger team , see you in the New Year.....now where did I put that extra large triangular chocolate ? ahh there it is underneath my Trilby. With winter tightening it's grip it can feel like the whole of nature has hunkered down until spring and there's not much out there to appreciate. That’s what can make winter the ideal time to build an appreciation for some of the less dramatic lifeforms, the ones you might overlook in the more fecund months of the year. Ladies and gentlemen, I give you the lichens. In fact, given that lichens cover (by some estimations) some 6% of the earth’s surface, overlooking them is something that we probably all do a lot of the time. If it wasn’t for the clean air act then this is something most town dwellers would have been forgiven for as lichens are a great indicator of air pollution – they don’t grow well in polluted environments. But nowadays they can be found almost anywhere, although admittedly you’d need to go to some of the more remote parts of northwest Scotland to see the best examples. But what is a lichen? Well, it’s complicated. And also a bit weird. Simply put, they are composite organisms. This means they are neither one thing or another, but more a new kind of life form that arises from (mostly) an algae living amongst the filaments of a fungus in a symbiotic relationship. The algae benefit by being protected from the environment by the filaments of the fungus, which also gather moisture and nutrients from the environment, and (usually) provide an anchor to it. The fungus benefits because the algae produces food by photosynthesis, something they are unable to do. They’ve been recognised as organisms for quite some time but it wasn’t until 1867 when Swiss botanist Simon Schwendener proposed his dual theory of lichens that their true nature began to emerge. However, common censunsus at the time was that all living things were autonomous so this was rejected at first (it seems the composite organism thing was just too strange) and it took many years and the support of high profile people, including our very own Beatrix Potter, to finally see the idea accepted. Nowadays, the arguments still go on. At the moment they are classified by their fungal component, but there is some debate over whether this is the right thing to do as two dramatically different looking lichens can be technically the same thing due to having the same fungus but two different algal parts. Confusing! In fact, once you start to look into them it gets extraordinarily confusing with identification being a really specialized field requiring microscopes and chemicals. But this doesn’t need to take away from the fact that with a little knowledge and open eyes they can add an extra element to any winter walk. A good starting point is to get to know the three most commonly accepted growth forms: Crustose (like a crust), Fruticose (like a little shrub) and Foliose (with leaf like structures). There are lots of others and the boundaries between these are sometimes blurry but get a cheap hand lens and go in close and you’ll be amazed at the microscopic and very alien world that is right there under your nose. Finally, here’s some Fun lichen facts! Unlike simple dehydration in plants and animals, lichens may experience a very high loss of body water in dry periods. Lichens are capable of surviving extremely low levels of water content (poikilohydric). They quickly absorb water when it becomes available again, becoming soft and fleshy. That’s tough! The European Space Agency has discovered that lichens can survive unprotected in space. In an experiment two species of lichen were sealed in a capsule and launched on a Russian Soyuz rocket in May 2005. Once in orbit, the capsules were opened and the lichens were directly exposed to the vacuum of space with its widely fluctuating temperatures and cosmic radiation. After 15 days, the lichens were brought back to earth and were found to be in full health with no discernible damage from their time in orbit. That’s tougher! Lichens are a pioneer species, often the first to colonize bare rock. They can grow in a very wide range of environmental conditions and can grow on almost any surface. They can even live inside solid rock, growing between the grains. Also quite tough ….. When growing on rocks some lichens slowly decompose them, contributing to the process of weathering by which they are turned into soil. Normally benign, this can cause a problem on artificial stone structures such as Mount Rushmore in the States which has to be regularly cleaned of Lichens. So tough even the might of the US struggles against them! 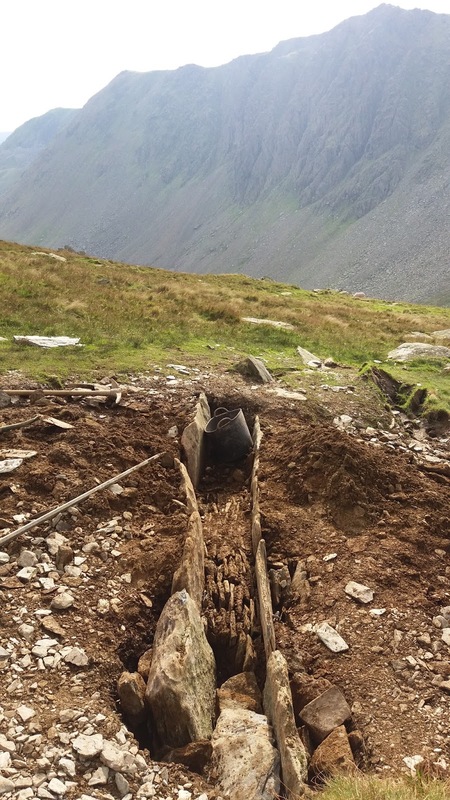 The South Lakes upland footpath team have been hard at it Fixing the Fells this year, whilst on our travels we've encountered wild weather, mountain mists, a healthy dose of hard working volunteers and one or two foot paths. 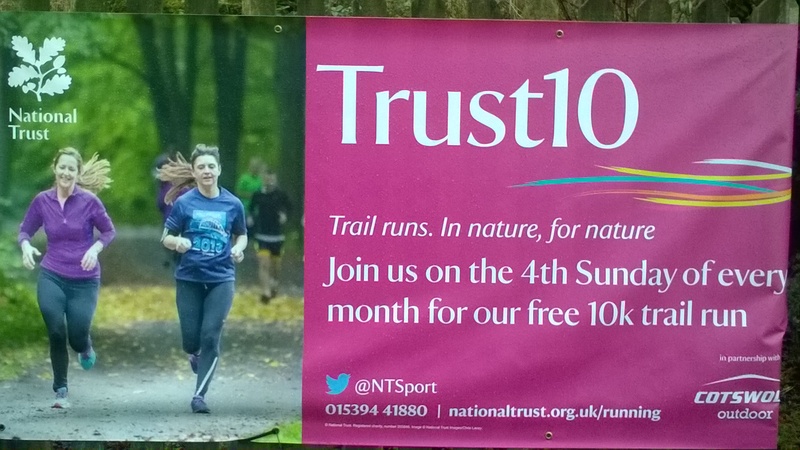 We've had projects running all over the Lakes and helped out some of the other teams too! Here's a rundown of some of the jobs we've been getting up to. Threshthwaite Cove is a beautiful quiet valley (if not a little windy at the best of times!) situated near Hartsop. Thresthwaite is a very damp place indeed and the path suffers a great deal from flowing water and foot fall. Above we have tried to define a path line and re-vegetate the damaged areas. Working with different volunteer groups we carried out work all the way along the valley including installation of rock stepping stones, path definition and drain building. 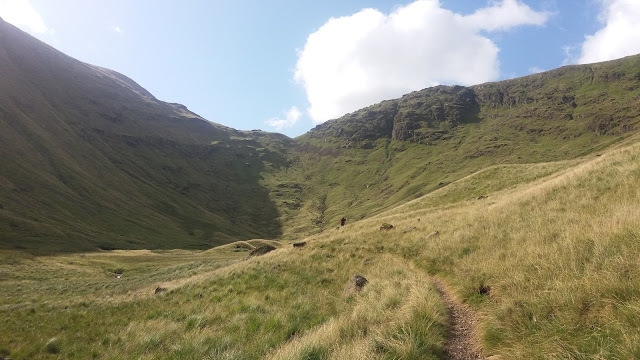 From time to time the upland teams like to help each other out, earlier in the year we had the chance to go to the dramatic wild west-ern fells to work on Sca Fell Pike. West Lakes team on brown tongue. Wastwater at the back. Brown Tongue is a popular route up England's highest mountain and can be incredibly busy all year round. To reduce erosion and help accommodate the vast numbers of feet on the hill the path from bottom to top (its a big path, trust me!) is being widened. In the picture to the right you can see the new and wider pitching merging into the older path which is soon to be replaced. We have have been paying some attention to the hills surrounding the popular Grisedale Tarn. 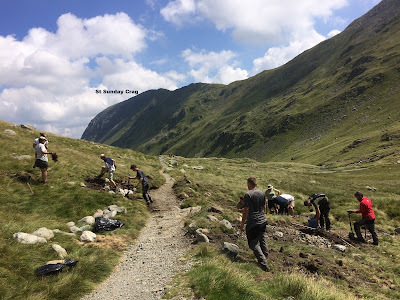 With many a hard working volunteer group and help from both the Western and Northern upland teams we've been landscaping out side routes and placing stepping stones over sensitive peat bog. And look here some kindly fellow has labeled the hills just in case!! Below is a section of much needed pitching Nick put in near the summit of Dolly Wagon Pike. Helvellyn is an understandably popular mountain which on a clear day rewards anyone who ventures up there with stunning views of the whole of the Lake district and beyond to up to Scotland and the Howgills to the east. It's therefore unsurprising to hear that we concentrate a great deal of effort up here. 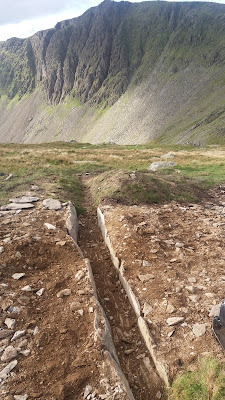 Striding Edge suffers a great deal of erosion along the sides of the crest of the ridge so it would be impolite for 'Fix The Fells' to not go and visit and chip away at the on going work up there. 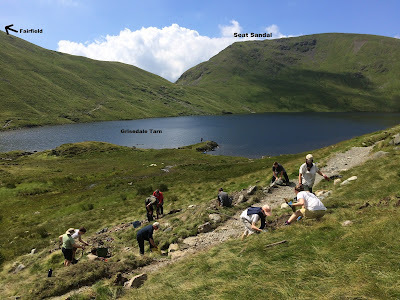 To end the fell season we decided to do a bit of work in our own back yard and our focus turned to Goats Hause which is the col between Coniston Old man and Dow Crag. This project was funded by EOCA or the European Outdoor Conservation Association, you may have seen/heard coverage of this earlier in the year on the TV or Wireless! There is a huge amount of damage to the vegetation in this area so we have been using the usual techniques to reduce this. In the photo above, the path is relatively thin however it was three times as wide before the area to the left of the path was landscaped out. So that's it for the fells for 2016 and next year's work plan is already in the pipeline, for now we're all having a well deserved break by getting on with some good old fashioned hard work down in the lowlands. As we get older we all need a little extra help to keep ourselves looking spectacular ! For me it’s my increasingly hairy ears, nose and eyebrows that require just that little bit more time spent in front of a magnifying mirror with the scissors and Remington nasal hair trimmer to ensure that I don’t start looking like the lovechild of Brian Blessed and Chewbacca ! At 238 years old Claife Viewing Station is no different and needs a little love and attention to keep it looking as it should . The Viewing Station was once a ‘must see’ destination for the very earliest tourists to the Lake District, when their traditional ‘Grand Tour ‘ of Europe was too dangerous an undertaking due to the French Revolution . 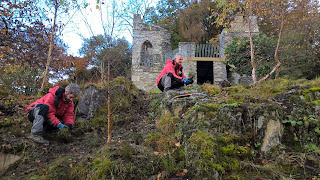 The Station, a now ruined building, lay hidden in the woods for decades until it re-opened to the public last year after a £1/2 million pound facelift and we continue with the care by restoring the landscape around the Viewing Station itself, so that the present day experience is as close to the original as possible. 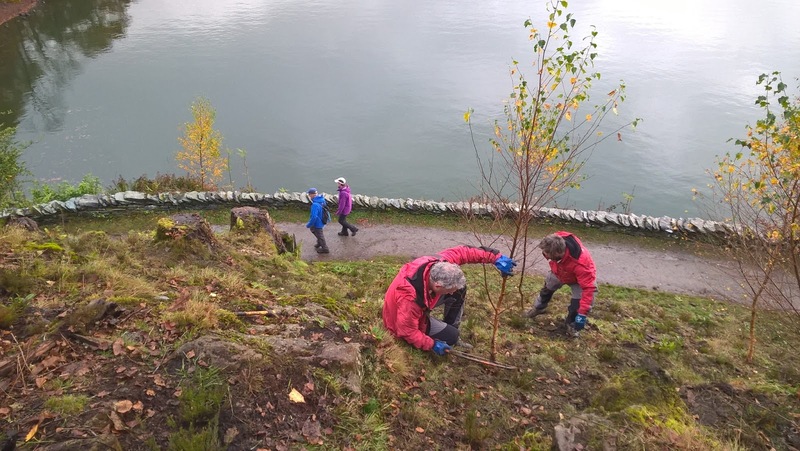 This week as part of our landscaping works, we have been planting 750 heather plants with the assistance of a couple of volunteer groups. We have also removed young self sown birch trees and in the near future will be removing more cherry laurel to expose more of the bare rock faces around the Station. All of this is being done to create a more thrilling , dramatic ’wild’ experience for our visitors. 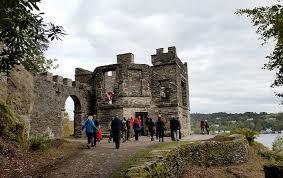 Come and see for yourselves , Claife Viewing Station is open all year round as is the Courtyard café. Located on the West shore of Lake Windermere, Far Sawrey,Ambleside, Cumbria. The Basecamp Toolstore...A Photo Essay. “Here’s one I made earlier”…Our woodland Ranger, and Project Manager – Richard, briefing the troops, with the woodstore built on a previous holiday as an example. Especially if the boss is sitting down on the job. …But preferably not your own fingers – Eyes down Gary! Another timeless technique – here’s Tony making the wooden pegs for the frame. These were traditionally used to avoid costly iron nails (a tradition kept alive by National trust budgets). Making sure the frame fits together…with a little gentle persuasion from Mr Sledgehammer. Ged the dog overseeing on-site assembly. Watch out for that car window! I don’t think my insurance covers oak-framed timber buildings. Gadzooks! Almost finished and looking great…Just needs a roof and a door and she’s good to go…come back soon guys!! Most people like trees. Some people love trees. Most people can name a few species of tree. Some can name hundreds. Most people have a favourite tree tucked away somewhere, it could be huge, tiny, tall, short, fat, thin, gnarly, smooth or wrinkled. It might have a special significance because of memories or experience. Alder are not generally a long lived tree and so rarely reach this size which is relatively common in oak. Being responsible for managing such an important tree often means making some difficult decisions, how much do we intervene with tree surgery? Do we let natural processes carry on which might result in alder's death? Often something else happens which modifies our management of the tree, this happened in the winter of 2013. Crown badly damaged by storms in 2013. Trees are naturally resilient and the alder bounced back the following spring with loads of new epicormic growth from the remains of the trunk. I felt that in order to protect the epicormic growth, and other important habitats around the tree from browsing we needed to fence the tree. Trees of this age support a huge number of specialist organisms from bats to beetles and birds, fungi to flies, retaining and protecting old trees provides vital habitat. Wood mould inside the hollow trunk vital for saproxylic invertebrates. Aerial roots within the trunk are also sometimes found in hollow trees, the alder is re-using nutrients made available by the fungal decay of its own wood! Wrens nest in the hollow trunk. Epiphytes living in the damp decaying hollows found on the old alder. Fallen branches left top decay close to the tree. As the dark mornings and evenings close in, it signals that we're nearing the end of the fell work season. Four months back I joined the upland ranger team and in this relatively short period we have literally covered miles. We've been involved in projects across the Lake District working alongside the other upland teams, volunteer groups and the dedicated 'Fix The Fells' Lengthsmen. 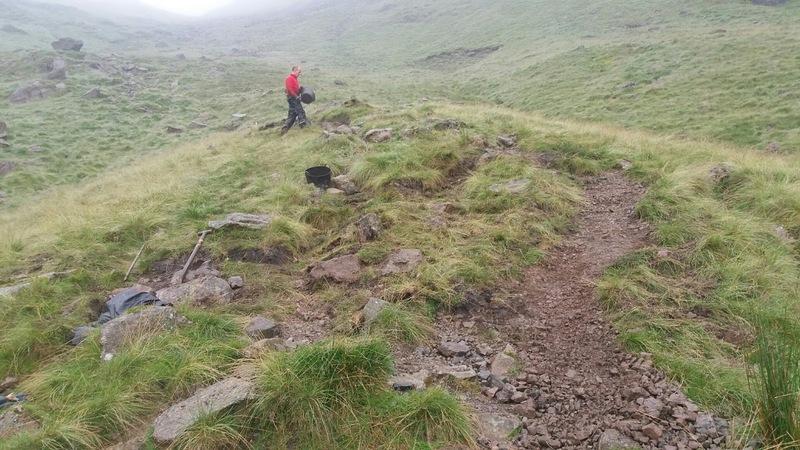 It's been a fantastic chance to learn the ropes of Upland erosion work whilst experiencing the Cumbrian mountains in the best and also the not so best weather, I learned my first lesson quickly - buy a waterproof camera. 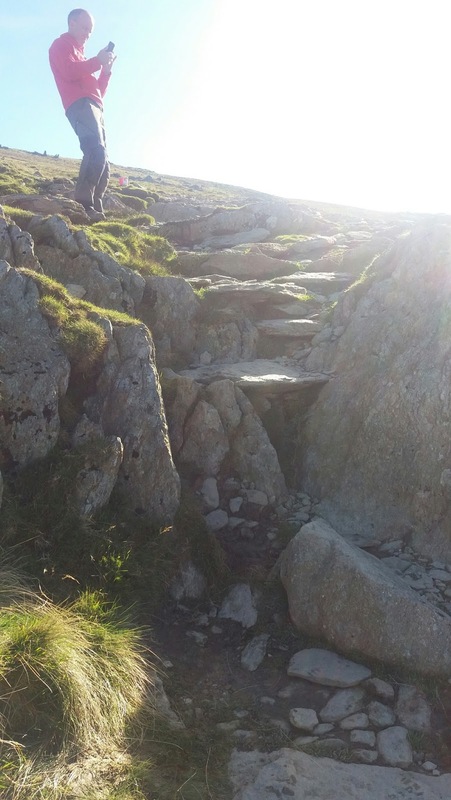 Here are few sights and experiences of a summer in the fells. Typically we start early in the morning around seven, this is a great opportunity to see the lakes in a more tranquil mood. After we meet at base we drive to the area or mountain we're working on and set off on foot to our work site, this can sometimes mean walking all the way to the top. Second lesson - breakfast is the most important meal of the day. The character of the fells can be dramatically changed by the weather so we come to work prepared with warm clothes, water proofs and emergency shelters. 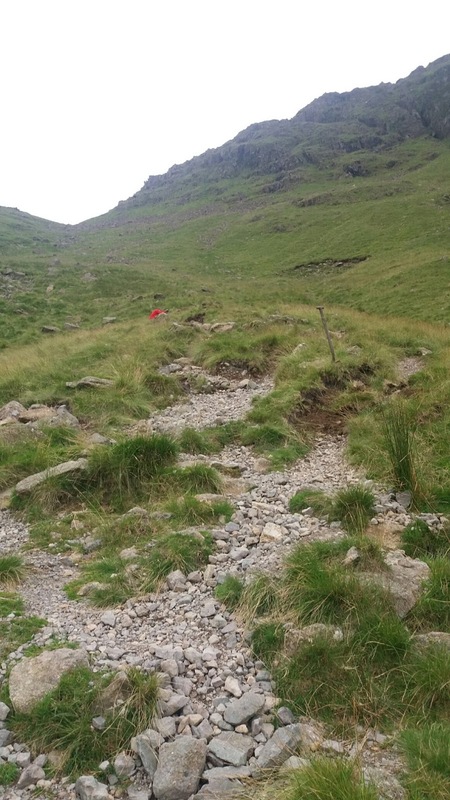 Trying to prevent or reduce erosion on the fells is our main aim. 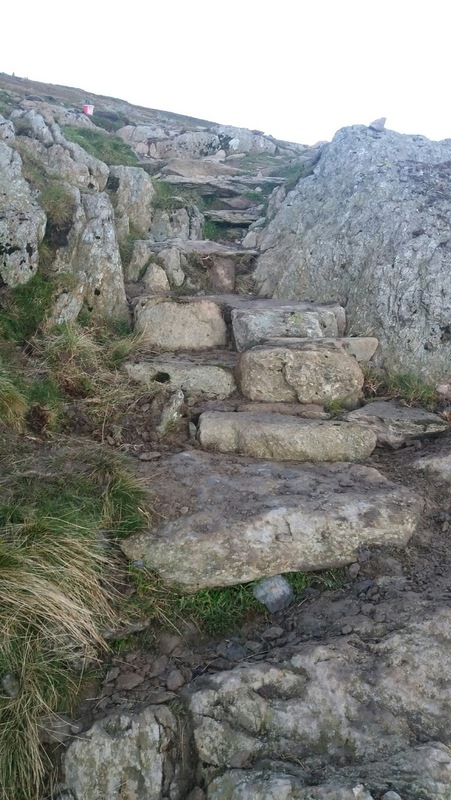 Currently we're working on Goats Hause just below the summit of the Old Man of Coniston. This is a highly popular path and this is evident by the multiple path lines running side by side. With the help of the Fix The Fells Lengths men we are trying to a define a single line and re- vegetate the the sides of the new path. Sometimes rock is flown in by helicopter to use on site, how ever in this case on Goats Hause the rock is gathered in situ whilst we work. Often when on the fells we get to see some of the hardy creatures that reside on and around them. 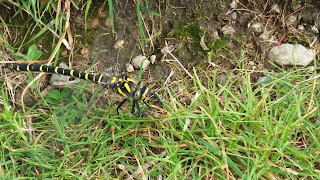 This is a Golden - ringed Dragonfly. This chap has one of the longest bodies of any European insect and is more likely to be found near fast flowing rivers and streams. 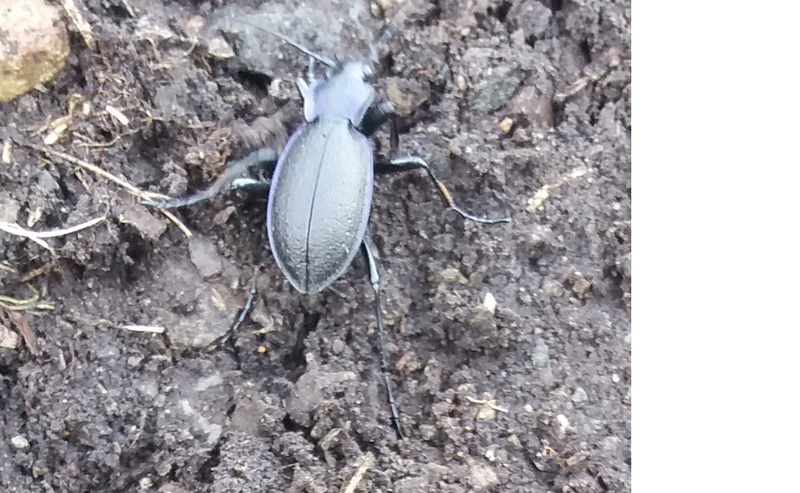 Here is a Violet ground Beetle which when seen up close has a very distinctive violet strip around its sides. As well as living on/in mountains they are commonly found in gardens much to the joy of keen gardeners as they predate pests such as slugs. That's it for this for this week so here are a couple of photo's some the awe inspiring views to be found in the lakes. Monitoring habitats and species is vital for successful conservation. Changes over time and over large areas can inform us of how best to manage those habitats. The data collected can be examined for long term trends linked to conservation. Changes that are as expected and those not anticipated. It is therefore important to select what to monitor, how, where and over what time. The Lake District is special for many reasons and one of them the presence of the Netted Carpet Moth (Eustroma reticulatum). A very rare species it is primarily known to only a few areas here, though, recently new sightings have been made in North Lancashire and possibly some in Wales too. 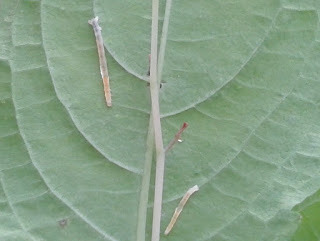 A possible explanation for its rarity is that its eggs are laid, and its larvæ feed, on only one plant, Touch Me Not Balsam (Impatiens noli-tangere), itself a nationally scarce species. Therefore, conservation of Netted Carpet Moth is also conservation of Touch Me Not Balsam. The UK's only native impatiens, it favours moist, nutrient-rich soils and is commonly found in damp open woodland with dappled shade, alongside streams and where there is regular ground disturbance. With few associated species it often forms pure stands of several hundred individuals. 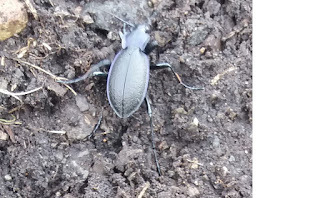 Though here in the Lake District sites of much larger populations numbering many thousands of individuals are known, particularly around Coniston and Windermere. Recent conservation work by the National Trust in the Lakes has resulted in a significant increase in the population of Touch Me Not Balsam. 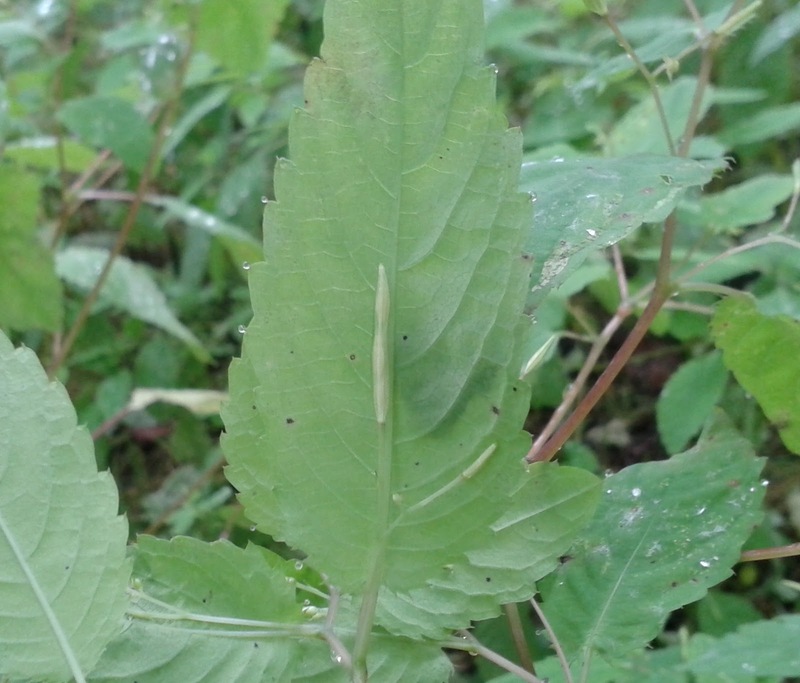 Winter grazing of cattle has been introduced to woodland sites known to have the balsam amongst its ground flora. The cattle trample the ground providing the much needed ground disturbance to spread the seed. The cows are then removed from the woodland before germination takes place. No other method of ground disturbance has proved quite so successful as cattle. Even with such successful conservation efforts as this the numbers of Touch Me Not Balsam are still known to fluctuate from year to year. A kind of 'predator - prey' relationship between the balsam and the Netted Carpet Moth occurs whereby as populations of balsam increase so too do the numbers of larvæ feeding on the food plant until a critical point in the larvæ population when the numbers of balsam start to deplete. 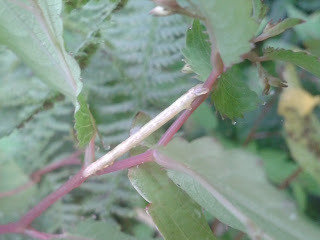 As the population of the food plant decreases so too do the numbers of larvæ feeding on the balsam until another critical point whereby the balsam can begin to recover and increase its population and the cycle begins again. Such is the delicate relationship between the moth and its food plant. And thus the need to monitor populations of both annually. So, Netted Carpet Moth eggs are laid during July to August meaning the caterpillars are fully grown by early to mid-September. And this is the best time to survey. We joined a group of Rusland Horizons volunteers for the annual survey of Netted Carpet Moth at Brantwood on the east shore of Coniston. 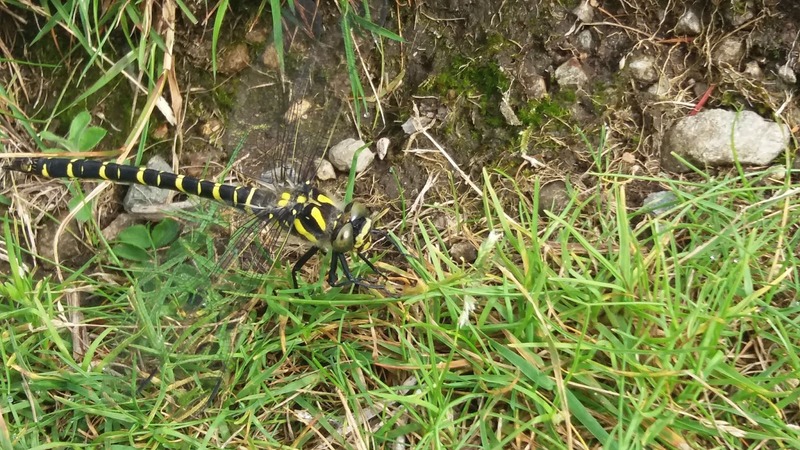 The survey was led by the National Trust's Wildlife and Countryside Advisor John Hooson and Dr. Paul Hatcher of Reading University. Together they have been monitoring the numbers of balsam and moth here for the last 20 years. Brantwood gardens are managed specifically with Touch Me Not Balsam in mind and head gardener Paul was keen to take us to spot where the recent felling of a tree, providing both light and heavy trampling of the ground beneath, had resulted in an explosion in the population of balsam. We began with a quick tutorial of how to spot the caterpillars which are to be found on the underside of the leaf and can camouflage themselves to look like a seed pod or a leaf stem. The method of monitoring with which we began was to count the number of larvæ per site. We paired off into groups, picking a site of the garden each, and first estimated the number of balsam plants on our site. 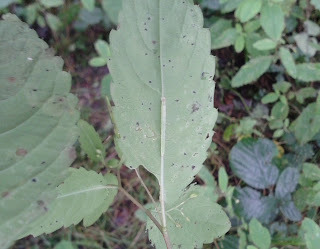 Then we counted the number larvæ we found on all the balsam, that we could reasonably reach, within our site, without trampling any of the neighbouring plants. We would then re-group and give Paul Hatcher the number of plants estimated on our site, the percentage of those plants counted and the number of larvæ found. These figures will be used by Paul later to estimate the number of larvæ in each site and in the gardens as a whole as well as having the actual number seen on the day. These figures will in turn will be used to estimate the number of Netted Carpet Moth at Brantwood. In the afternoon we moved to another location along the Coniston east shore called High Barn Wood. This site has seen winter grazing of cattle since 2001 which has resulted in widespread ground cover of almost pure stands of Touch Me Not Balsam. 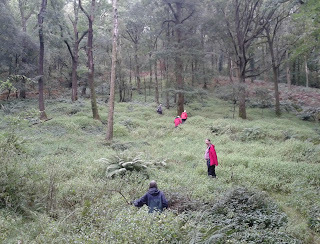 With such large numbers of plants over a much larger area we used a different method of surveying here. 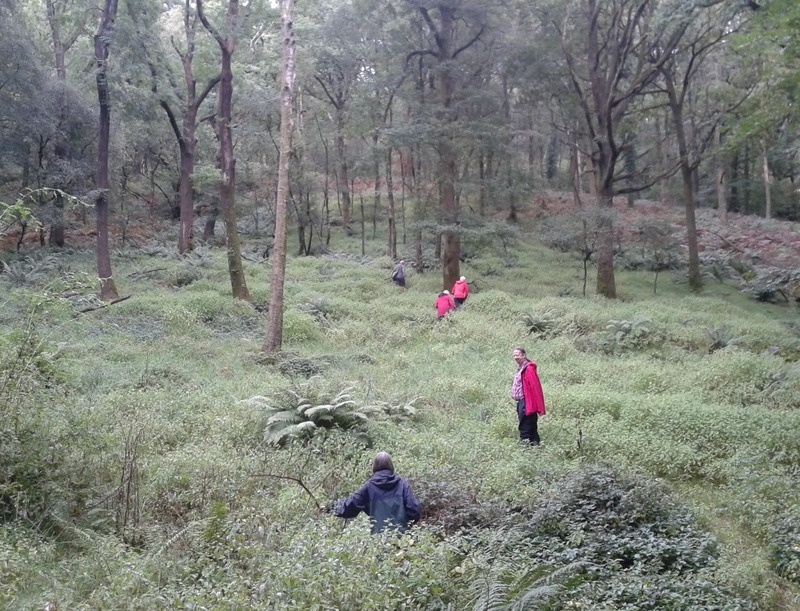 This time we worked individually each picking an area of woodland and checking a total of one hundred plants in that area. This gave us the number of larvæ per one hundred plants. We did this in three or four different areas and again gave all the results to Dr. Hatcher who, again, would use the figures, later, to scale up an estimate of the density and number of larvæ in the whole site as well as having the actual number seen in the woodland. Surprisingly the numbers of larvæ found in High Barn Wood appeared to be less than those found in Brantwood gardens. Though as Dr. Hatcher explained it is often the case that large areas of balsam yield a lower density of larvæ, though overall higher numbers, than smaller sites. After 20 years or more surveying the moth and its food plant, however, he has yet to observe any clear correlation between site and numbers of caterpillar. A large, seemingly ideal, habitat may produce only a handful of caterpillars one year where as a small patch of balsam next to a path produce pleasingly high numbers. And then, the following year, the opposite. Musing on why some sites appear to be more favourable than others to the presence of Touch Me Not Balsam - vital, remember, for the existence of the Netted Carpet Moth - Paul Hatcher noted that the woods around us had been coppiced for charcoal production in years gone by. 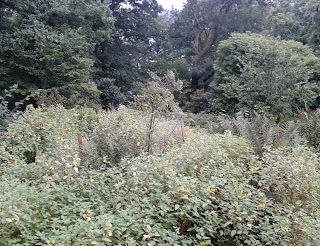 That the combination of a 10 year coppice cycle, providing dappled light, plus the trampling of the ground by those working the woods would provide ideal conditions for the balsam to grow. And that the presence of Impatiens noli-tangere as the primary ground flora in a woodland may be a strong indicator of historical industrial woodland. And so, from this years survey, it appears that the overall number of larvæ in the Lakes is increasing year on year. Which is encouraging news to both surveyor and conservator. Incidentally, the Netted Carpet Moth itself can be surveyed at dusk in early July to mid-August. Or, more precisely, according to one intrepid volunteer, during the last week of July and first week of August at 9:15pm. So there you go. A seed pod. Or is it a caterpillar? A caterpillar. Or is it a seed pod? Tarn Hows has been a hive of activity this summer. The bank holiday weekend was bursting with visitors enjoying this classic Lakes spot and our rangers and volunteers have been busy all summer setting up free activities for all of our visitors to enjoy. From pond dipping to weekly guided walks, indoor art to mini-beast hunts, learning how to weave hazel to whizzing around the tarn on our balance bikes, lots of fun has been happening each week, come rain or shine. By far the most popular activity that has taken place this summer has been pond dipping. Families have been dipping into our tarn to see what they could find and learned how to identify the aquatic life here. Water beetles, water boatman, pond skaters and damselfly nymphs have been found in abundance but our most popular find (if slightly off-putting) has been that of many leeches found lurking at the bottom. In addition, the use of our trampers has been ever more popular which allow people of all abilities to enjoy a trip around the tarn. The teddy-bear like Belted Galloways have of course proved popular with our visitors as well as the odd sightings of red squirrels and even an otter! As for now, the flurry of visitors from the summer is slowing down and it is now a great time of year to come and enjoy the range of wildlife that can be seen around the tarn as the leaves turn into their autumn colours. Tramper hire continues for the next few months, just call the office to book your slot: 015394 41456. I’ve been the assistant ranger for Hawkshead and Claife for nearly twelve months now but I've been a visitor to the lakes for the last 30 years. Climbing the fells and canoeing the lakes, I’m sure, set the foundations for me wanting to work in the countryside. 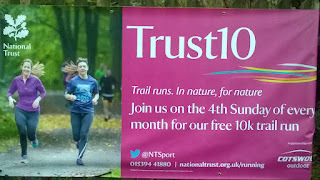 I have spent a number of years volunteering for National Trust and have worked for zoos and Wildlife Trusts, so I have a keen interest in wildlife and conservation. I have also spent too many years as a tree surgeon, so I’m also very keen on my trees!